January 23 is National Pie Day and in honor of this delicious American celebration, here are some healthier options that are as “nice as pie” and can be enjoyed as meals and desserts. As American as well, apple pie, National Pie Day has been sponsored by the American Pie Council since 1986. This fun holiday started in the 1970s by a Colorado nuclear engineer, craft beer brewer and author named Charlie Papazian who declared his own birthday, January 23, to be National Pie Day. And while I couldn’t agree more with Charlie that pie is a perfect birthday treat, many of our favorite store-bought, restaurant or homemade pies can also be high in fat, calories and sugar. That’s why I’ve put together my top favorites in this list of lighter pie options for all mealtimes. So you can have a slice of the fun, and still keep up with healthy eating goals as you celebrate. Pie for breakfast? Yes, please! 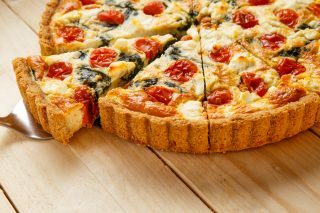 This Spinach and Tomato Quiche puts a unique spin on a popular dish by blending brown rice and cheese to make the crust. It’s a great way to sneak a whole grain in to your morning meal, but it’s hearty and delicious enough to enjoy at lunch or dinner as well. Shepherd’s Pie has very humble beginnings, and was named after the shepherd himself. Traditionally made with a mixture of lamb and vegetables such as peas, onions and carrots and topped with mashed potatoes, this meal was a stable source of carbohydrates and protein in northern England. Now we have numerous varieties, thanks to the availability of different proteins and vegetables at our disposal. And while my husband will argue that any variation made with something other than lamb is a cottage pie, the food lover in me will just say that Shepherd’s Pie, in all of its varieties, is a wonderful comfort food. The dietitian in me, however, loves these Mini Shepherd’s Pies. They’re portion-controlled, loaded with spinach and topped with squash puree in place of the potato. The squash and spinach are excellent sources of vitamin A, which is important for good vision and immune system support—bringing this simple comfort food to super food status. A-rich winter squash and vitamin C-rich kale, making this dish hearty, flavorful and nutrient packed. It’s also a breeze to make—you can use a rotisserie chicken, frozen squash and the puff pastry is placed on the top only. As easy as, you guessed it, pie! If you’re like me you love pie, and your favorite part is and always will be the filling. With this Fun Spin on Apple Pie, you get to enjoy all the flavors but you get to skip the butter, refined flour and homemade pie crust mess. Not to mention, apples are fantastic. They contain fiber which can help stabilize blood sugar, lower cholesterol and promote satiety (that wonderful feeling of being and staying full after a meal). They’re also high in antioxidants—studies have shown that intake of apples is associated with a reduced risk in certain cancers. Don’t save this recipe for National Pie Day—it’s so simple and healthy you can enjoy it all year long. 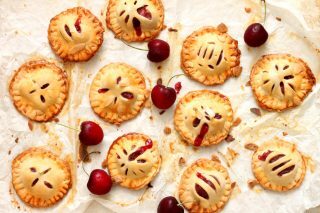 I’m a firm believer in the saying, “All things in moderation.” And when the portion size is smaller, you can enjoy a serving of your favorite things—like these Mini Cherry Pies. Don’t like cherry? You can easily substitute your most-loved pie filling, serve them in this fun, bite-sized form and enjoy. So whether you choose to delight in a slice to celebrate National Pie Day for breakfast, lunch, dinner or dessert—these healthier options are both delicious and more nutritious than standard pie fare. Here’s to hoping they leave you with a pie-eating grin.